The French brought beignets to Louisiana in the 18th century and since then they have become commonplace there. In 1986, the state of Louisiana even declared these puffy, wondrous delights the official state doughnut. Beignets can be easily found in the area, but the most popular place to snack on this originally Acadian treat is at Café du Monde. The beignets there, which are served in a plate covered with a mountain of icing sugar, are truly special. 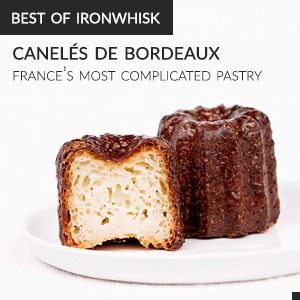 That, however, doesn’t mean that you can’t make them at home. You’re pretty special yourself. Generally, beignet dough is only lightly sweetened. A few spoonfuls of sugar help provide the necessary carbohydrates for yeast anaerobic cellular respiration (I took biology this year and our slides on yeast were quite exciting). Most of the sweetness comes from the icing sugar generously sifted over the beignets. I put nowhere near as much icing sugar on top as the folks at Café du Monde do. You’re very likely to inhale a teaspoon or two of icing sugar there by sticking around for an afternoon snack. I know some of you are scared about working with yeast. I used to be scared, but then I defeated the little monsters by burning them alive. Don’t be scared of yeast. Think of yeast as little gas producing creatures that you can exploit for the carbon dioxide they create before killing them. They should be scared of you. You’re bigger. You’re stronger. You can do it. Just make sure your buttermilk is the proper temperature and you are all set to most likely succeed. Just don’t be too confident. No one likes obnoxious people. 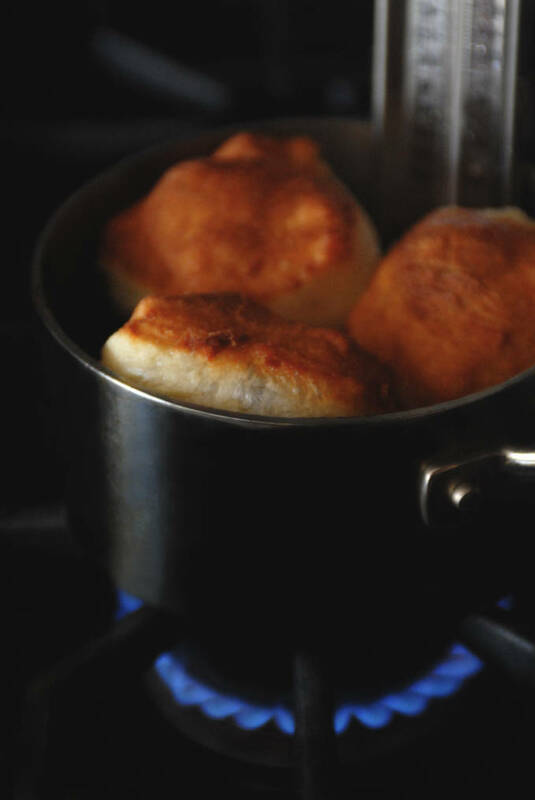 The process to make these beignets is actually quite simple. The hands-on time is quite low (especially if you use a stand mixer, in which case all you have to do is plug it in). Mix together some ingredients. Knead them. Wait a few hours or overnight for the dough to proof. I decided to wait “overnight” (about 18 hours). Cut up the dough. Fry it. That’s all. The hardest part is cutting the super sticky dough. The best way to cut the dough is not with a slicing motion, but rather with a pressing motion. Press down with your knife. I suggest placing the pieces of dough on parchment paper directly after cutting them because the dough is a pain to pull off a countertop. Give these a go. I really enjoyed them. You should note, however, that they must be eaten within an hour of being fried, or else they will taste like a soggy mess. Just take the beignets out from the oil, pour a few bags of icing sugar on top, and serve. 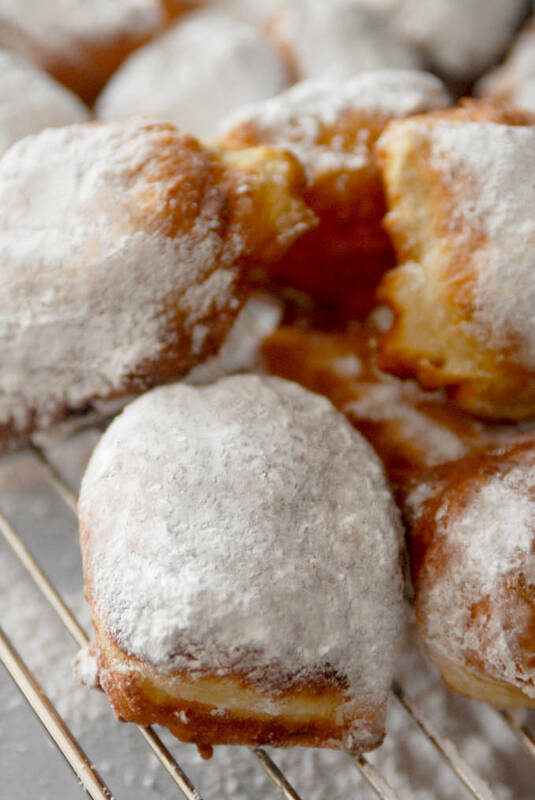 Buttermilk beignets that taste like those from Cafe du Monde. Deep fried bliss. Recipe slightly adapted from Joy the Baker. Mix together the milk and buttermilk and warm the mixture up in the microwave or in a saucepan until it reaches 100°F. The milk mixture will be warm to the touch. Pour the milk into the bowl of a stand mixer and stir in the sugar. Sprinkle the yeast over the milk-sugar mixture and stir gently. Wait a few minutes to activate the yeast (the mixture will be foamy). Dump in the flour, baking soda, and salt. Use the dough hook attachment and use the lowest speed to mix everything together. Once everything is moistened, increase the speed to medium and beat for five minutes. (If you're using a KitchenAid, the manual says not to go past low speed for kneading dough, but who reads manuals anyway except me?) If you're kneading by hand, you're going to have a tough time because this dough is very wet. Do not freak out. Do not add more flour regardless of whether you are kneading by hand or with a stand mixer (okay, if you're kneading by hand you can add a touch more flour). Use a spatula to make sure all the flour at the bottom of the bowl is incorporated. Cover with a towel and let the dough rest in a warm place for an hour, or in your fridge overnight. I recommend leaving it a few hours more than that even to help develop the flavours. Generously flour your work surface with bread flour. Use a floured rolling pin to roll out the dough into a roughly 1cm (~1/2 inch) thick rectangle. Don't worry if the edges aren't perfect. Use a knife coated with flour to cut the dough into 4cm (~1.5 inch) squares. Press down with the knife instead of sliding it through the dough for the best cut. Place the dough squares on parchment paper so that they don't stick to your counter. Pour about 7cm (~3 inches) of oil in a saucepan and heat the oil until it reaches 375°F. Set up some paper towel to absorb any excess oil left on the beignets after frying. Make sure to have a cooling rack, a sifter, and icing sugar ready to coat the beignets. Fry the beignets in the oil, about one minute per side, until golden brown. Remove any excess oil and then immediately place them on the cooling rack and generously dust them with icing sugar. Eat them. Now. These look absolutely beautiful, you did a wonderful job with the beignets. And pretty impressive biology lingo too! Ughhh beignets are sooooo goooooood. I have yet to find good ones where I live, so perhaps I will try to make them myself. These look fantastic! I just….I want to marry these beignets. I love how quick and easy these looks! Especially with my stand mixer :) I’ve always wanted to try beignets. I can’t remember the last time I had these beauties, thanks for the inspiration! Your description of Beignets and pictures made me want to try these! Wish I have tasted them before but I just learned about them thanks to your post. :) I love fried food in general and this looks very tempting (and I don’t mind deep frying)!